Dr. Trent Douglas and Dr. Katerina Gallus discuss tummy tuck surgery including the best candidates, combined procedures, and recovery. Hello, This is Dr. Trent Douglas with Restore SD Plastic Surgery. I’m joined today with my partner… Dr. Katerina Gallus. Today we’re going to talk about tummy tuck surgery. Tummy tuck surgery or, abdominoplasty, is the means of restoring your shapely figure after having children. It’s considered a body contouring procedure and is not a substitute for weight loss. Abdominoplasty or tummy tuck surgery, fixes stretched out abdominal muscles that can occur after pregnancy. Whether that’s one or multiple pregnancies. Tummy tuck also removes excess skin and improves your body proportions. Tummy tuck is best performed on patients that are at a healthy weight and already following a diet and exercise program. For some patients, adding liposuction might improve the results. If you’d like to learn more about tummy tuck, we’re here for you. 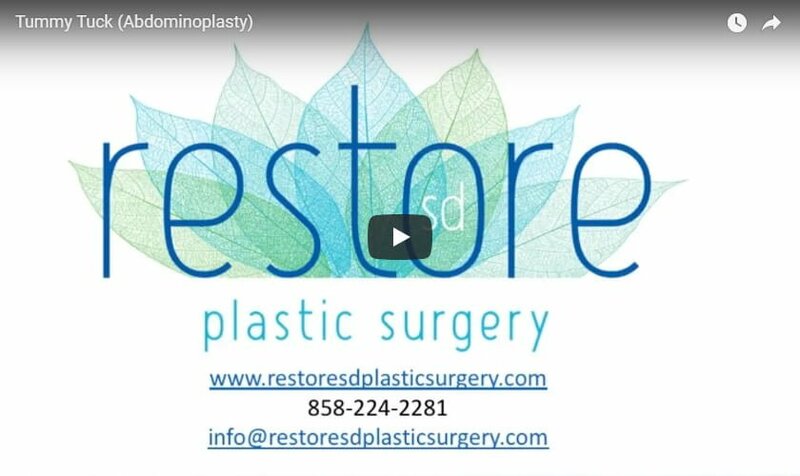 Please come in and see us at Restore SD Plastic Surgery.